It's another Friday challenge over at Your Next Stamp. The sketch and color combo is so much fun and can make for some great holiday creations. 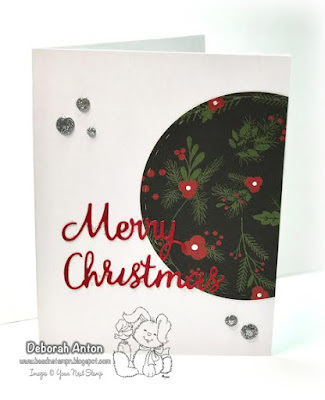 For my card, I kept it CAS to showcase this patterned paper I love from Carta Bella's Christmas Delivery collection. That became the focus cutting out the shape with the YNS Circles with Stitching and Dots layered dies. I then used the Christmas Words die set for the sentiment that I ran through my Xyron sticker maker to make the words easier to stick! The card was finished with some Silver Tinsel Gumdrops and this makes for an easy Christmas card that you can punch out quickly or make multiple times. We hope you do play along with us for you to link up your creation for a chance to win a YNS Gift Certificate! Thanks for stopping in and hope you have a great Friday! Your Next Stamp DT Dare - CASE It! It's that time to share with you our monthly DT Dare over on the YNS Blog and this month we are CASEing someone on the team. For my card, I CASE'd a card by Laura called Hey Foxy! I love the CAS look and I had an idea to change it up a bit using the fun Holiday Lights Die and an image from Smiley Happy Critter Crew. The patterned paper is a newly released collection called Winter Plaid. I just love it. Perfect for many occassions. I stamped the image and colored him in with Copics before cutting him out. I used the Stitched Square die for the center panel and added the Holiday lights over it and a little on the head of the cute dog. 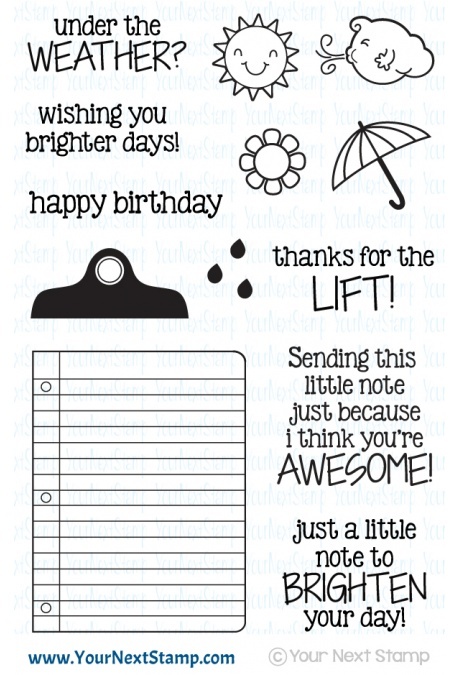 The dog is popped up while the sentiment is stamped directly onto the patterned paper. Be sure to stop by the YNS Blog to see all the inspiration from the team. Leave a little love while you are there for your chance to win a stamp set of your choice. Thanks for stopping by and hope you have a great hump day! It's hard to believe that 2016 is quickly coming to an end. Every year seems to pass quicker than the last, doesn't it? The DT at Your Next Stamp have come up with different projects spotlighting a favorite set that was released this year and there are some wonderful creations made! Using white card stock for the base, I knew I wanted to keep this CAS since it was for a boy. No frills for my little, that's for sure! Some patterned paper from Crate paper was used, while I used some brown colored card stock to cut out the clipboard to adhere the "paper" to. 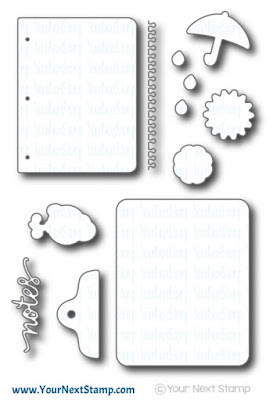 The paper image was stamped with YNS Stone Grey ink and cut out using the coordinating die set. 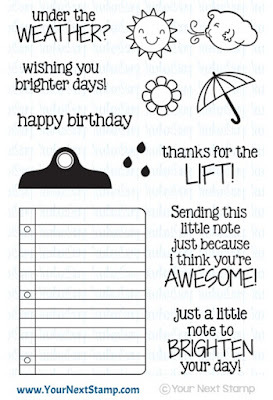 I stamped the sentiment directly onto the paper and cut out the clip using the same ink and die set. The whole thing was then popped up. I completed the look with adding the 'notes' cut out and some fun gumdrops to mix. Hopefully this will be just what he needs to perk him right up. Be sure to continue to hop along and a leave a comment along the way. 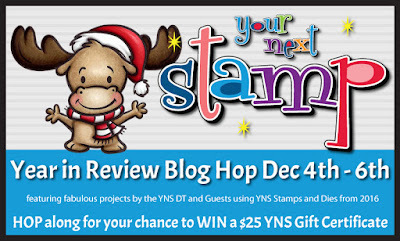 You can win a $25 gift certificate to the YNS Store just leaving a little love. Thanks for stopping by and hope you have a great weekend!